Bishop Mark Davies of Shrewsbury preached at the Solemn Mass offered to mark the end of the Latin Mass Society’s 3rd Annual Walking Pilgrimage to Walsingham on Sunday, 26 August. The Mass was celebrated by Canon Olivier Meney, ICKSP, with Fr Bede Rowe (the pilgrimage chaplain) as Deacon and Fr John Cahill as Sub-Deacon. Gregorian Chant was provided throughout the pilgrimage by a schola assembled from amongst the walking pilgrims and directed by Matthew Schellhorn, who is also our Local Representative for Southwark North. 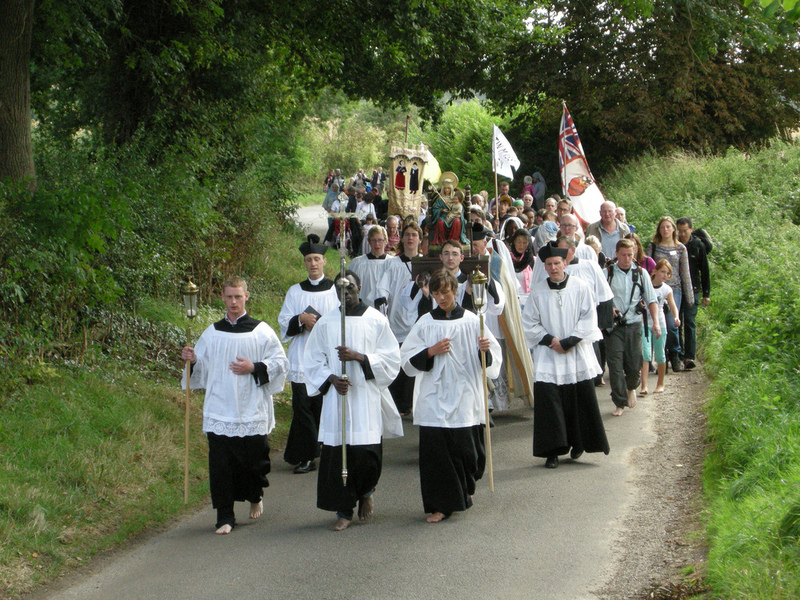 Around 70 people took part in the three-day, 55-mile walk from Ely in Cambridgeshire to the Slipper Chapel in Walsingham, which was offered for the conversion of England. The pilgrimage began with Sung Mass, celebrated by Fr Cahill, offered on the Friday morning at St Etheldreda’s Catholic Church, Ely. 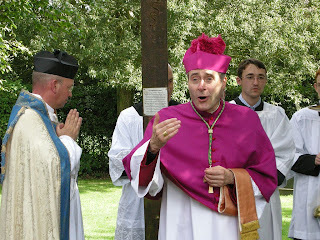 The MC was Rev James Mawdsley, one of the English seminarians studying with the FSSP. Mass was followed by the traditional Pilgrims’ Blessing given by Fr Rowe. A visit was then paid to Ely Anglican Cathedral to prayer for the conversion of our separated brethren. By the end of the afternoon, the pilgrims had been blessed with beautiful sunshine and had reached their first billet at Stoke Ferry near King’s Lynn. Sung Mass on Saturday morning was in the family chapel at Oxburgh Hall, a fifteenth-century moated manor house, which, although now owned by the National Trust, is still lived in by the Bedingfield family whose ancestors built it. Oxburgh has a long history as a centre of recusancy and boasts its own priest’s hole, which pilgrims were given the chance to visit after Mass. The pilgrims continued through Saturday, praying the Rosary, singing hymns and songs, and getting absolutely soaked through as the heavens opened and thunder and lightning let loose on the Norfolk landscape. By the time the procession of pilgrims reached Harpley village, their Saturday evening stop, spirits had recovered somewhat, which was further aided by a visit to the Rose and Crown pub in the village. 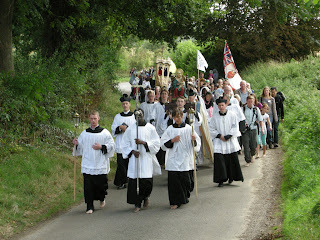 Sunday saw the last leg of the pilgrimage and the tired pilgrims reached their destination of the Slipper Chapel. They were joined by a coach full of people who had travelled from London for the day to attend the final Mass in the Chapel of Reconciliation at the National Catholic Shrine. Following Mass, Bishop Davies gave his blessing (in Latin) to the pilgrims. The statue of Our Lady of Walsingham, which had been carried throughout the final day of the pilgrimage led the procession of well over a hundred people along the Holy Mile to the grounds and ruins of Walsingham Abbey, the site of the Holy House of Nazareth, built by the Lady Richeldis in 1061 and which, like the abbey, was destroyed under Henry VIII’s Dissolution of the Monasteries. Prayers of thanksgiving were offered by Fr Bede Rowe followed by veneration of the statue of Our Lady. LMS General Manager, Mike Lord, said: ‘This year’s pilgrimage was the most successful yet, with the number of participants rising to 70 from last year’s total of 30. This is very encouraging. Several family groups joined us, which we were delighted about and, although most pilgrims were young people, there was a good spread of ages. Everyone was most impressed by two ladies aged 84 and 86 who completed the walk. ‘We are very grateful to Bishop Davies for agreeing to attend in choro for the Solemn Mass and for preaching. There are many other people who put in many hours of work to make this event the great success it turned out to be and we would like to thank them all. 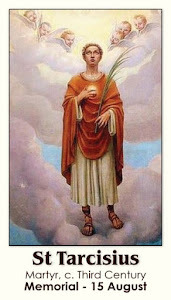 Members of the Sodality of St Tarcisius should renew their commitment annual, and are encouraged to make this commitment at around the time of the Feast of St Tarcisius (15th August). The following prayer should be said, with devotion. If possible, before the Blessed Sacrament. Last week was the St Catherine's Trust Summer School, which ran alongside the Latin Mass Society's Latin Course. Between them, we had three priests: LMS Chaplain Fr Andrew Southwell, Fr Thomas Crean OP, and Fr John Hunwicke of the Ordinariate of Our Lady. This enabled us to have Solemn Mass five days in a row, which can't have happened very often in the UK for quite some time! We also had three Missae Cantatae. The great advantage of this from the training point of view is that it enables servers to see repeatedly, for real, what happens in the ceremonies, and to experience different roles. We also made use of the services of a young man on the Latin Course who is preparing to go to the FSSP Seminary in the USA, Our Lady of Guadalupe at Denton, Nebraska. The Summer School is a great opportunity for young people, a week of solid Catholic experience, with liturgy and a wide range of subjects with our enthusiastic volunteer staff. There is no fixed fee; the whole thing is very generously sponsored by the Latin Mass Society and others. There is more about the Summer School here; the St Catherine's Trust website is here.